Hair loss treatment is the cornerstone of what Ashley and Martin provides to our patients, here’s another case study demonstrating its effectiveness. For the last year and a half 23 year old student Kasran* had been noticing his hair become steadily thinner all over. Kasran had watched the men in his family, including his father, uncles and grandfather, lose their hair; with this family history of hair loss in mind a close relative urged Kasran to seek hair loss treatment before it was too late. After considering the idea of getting treatment for his hair loss for four months a friend who was already receiving treatment with Ashley and Martin referred him to our services. The consultant trichologist Kasran came to see took a medical and family history and examined his hair loss. 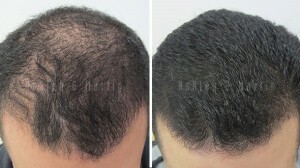 At this early stage the diagnosis was Male Pattern Hair Loss, Norwood II; without hair loss treatment Kasran would undoubtedly progress further through the hair loss stages. Never having used any other hair loss treatments Kasran listened as his consultant explained to him why his hair loss was occurring and how the multifaceted approach to treatment that Ashley and Martin offered would produce the most effective results for him. The loss of hair density Kasran was experiencing had not yet reached an advanced stage and his consultant recommended a RealGROWTH® medications hair loss treatment program with regular laser treatments to stabilise his hair loss and regrow his lost hair. Kasran went away and thought about the information he had been given. After deciding to go ahead with hair loss treatment he made an appointment to come back and see his consultant two weeks later. When Kasran came for his first progress check-up he was surprised and very happy with the early results of his RealGROWTH® program. His diffuse hair had increased in density beyond what he had expected and although he had watched as his hair regrew it wasn’t until he saw his comparison photographs side by side that he truly realised the overwhelming success of his treatment.